Lower respiratory tract infection (LRTI) is the leading cause of death worldwide in infants and children. Mortality due to LRTI reached 265,000 in year 2010, which was dramatically higher in developing countries. Boys were affected more than girls. It accounted for 7-11% of deaths in children less than 5 years of age in the Kingdom of Saudi Arabia as reported by WHO health statistics 2013. The main etiology of this disease is viral infection, which is much more common than bacterial and fungal infections. Out of 214 patients admitted to the King Fahd Hospital of the University with diagnosis of LRTI from May 2010 to May 2011. Blood samples were collected from 149 patients between ages of 1 to 5 years. Clinical information was retrieved via a retrospective review of medical records to determine the clinical manifestations and any underlying conditions or comorbidities of patients. Venous blood samples were obtained either at the time of visiting an emergency department or immediately after hospital admission. Samples were centrifuged and serum was stored at −70 °C until used for analysis. This study was approved by the Ethics Committee of the institution. We have used high sensitive real-time PCR assay to detect the viral genome in clinical samples. Viral RNA was extracted from 200 µl of serum samples using the QIAamp viral RNA kit (Qiagen, Hilden, Germany) according to the manufacturer's instructions. This kit does not exclude the extraction of DNA along with the RNA and no DNase digestion was used. Internal control RNA was spiked into each sample to check the RNA extraction efficiency. cDNA was then synthesized from the isolated RNA using the Reverta-L kit according to the manufacturer's instructions (Sacace Biotechnologies, Italy). Six different multiplex real-time PCR reactions (Sacace Biotechnologies, Italy) were then used to detect the following viruses: PCR mix-1 detects the respiratory syncytial virus and the metapneumovirus; PCR mix-2 detects parainfluenza viruses 1 and 3; PCR mix-3 detects parainfluenza viruses 2 and 4; PCR mix-4 detects human coronavirus (hCov) OC43, E229, NL63, and HKUI; PCR mix-5 detects the bocavirus and adenoviruses B,C, and E; and PCR mix-6 detects all 100 serotypes of the rhinovirus. All PCR mixes contain positive and negative control. All samples were spiked with an RNA internal control before nucleic acid extraction. A sample with a negative internal control result was not considered, and the extraction was repeated again. One negative control was run along the processes of nucleic acid extraction reverse transcription and real-time PCR with every group of samples. PCR was performed on the Rotor-Gene Q (Qiagen, Hilden, Germany). Viremia caused by the different studied viruses was detected in 47 (31.5%) of the 149 tested cases. HBoV was detected in the serum of five cases; these five cases will be further evaluated in this descriptive study. 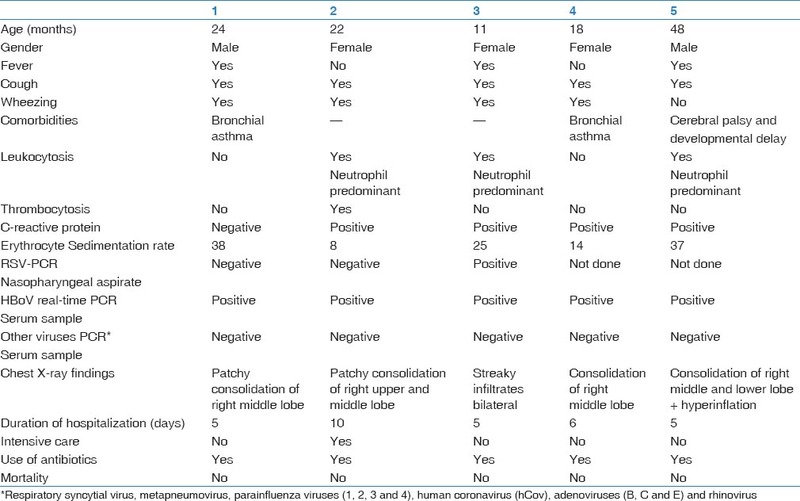 Description of five HBoV-infected cases [Table 1]. On August 16, 2010, a 2-year-old boy with a known history of bronchial asthma and febrile convulsions was seen in the emergency department of King Fahd Hospital of the University with respiratory distress and fever. He was having cough, shortness of breath, fever, watery diarrhea and vomiting for 2 days duration. Further medical history was unremarkable. At admission, his temperature was 38.8 °C, respiratory rate was 60/min, and oxygen saturation was 93% in room air. His chest examination revealed intercostal retractions and bilateral fair air entry with crepitation and rhonchi. He had neither skin rash nor abnormalities in heart and abdominal examinations. Analysis of the blood drawn at the day of admission revealed PCo2 of 25.4, negative C-reactive protein, erythrocyte sedimentation rate 38, and no bacterial growth in blood and throat cultures. Complete blood count, electrolyte and hepatic markers were within normal reference ranges. Nasopharyngeal aspirate tested by PCR was negative for Respiratory Syncytial Virus. Chest radiography showed patchy consolidation at right middle lobe. Patient was admitted to pediatric ward and started on albuterol and budesonide nebulizers in addition to oxygen therapy. Antibiotics were initiated at the time of admission. He showed improvement after 48 hours in regard of respiratory effort and oxygen flow rate. His fever resolved after 72 hours with highest spike of 38.8° C. He was fit for discharge after five days of admission. On October 10, 2010, a 22-month-old girl who is known to have recurrent wheezing was seen in the emergency department of King Fahd Hospital of the University with respiratory distress. She was having cough, coryza, and shortness of breath for 2 days. Further medical history was unremarkable. On examination, she had severe respiratory distress in the form of intercostal and subcostal retractions. She was afebrile, respiratory rate was 55/min, and O 2 saturation was 88% in room air. Her chest examination revealed bilateral poor air entry with crepitation and rhonchi. She had neither skin rash nor abnormalities in heart and abdominal examinations. Analysis of blood drawn at the day of admission revealed PCo2 of 36.5, positive C-reactive protein, erythrocyte sedimentation rate 8, and no bacterial growth in blood culture. Complete blood count showed leukocytosis (16.7) predominantly neutrophilia and thrombocytosis. Nasopharyngeal aspirate tested by PCR was negative for Respiratory Syncytial Virus. Chest radiography showed patchy consolidation of right upper and middle lobes. Patient was admitted to Pediatric intensive care unit. She was started on albuterol, ipratropium bromide, prednisolone, and oxygen therapy. Antibiotics were initiated at the time of admission. Because she was in severe respiratory distress, magnesium sulphate and aminophylline were given. She did not require mechanical ventilation. She showed improvement after 48 hours of admission in regard of respiratory effort, decrease flow of oxygen, and spacing of bronchodilators. She was afebrile during admission. She stayed five days in the intensive care unit and completed ten days of antibiotics as inpatient. On December 3, 2010, an eleven-month-old girl not known to have chronic illness was seen in the emergency department of King Fahd Hospital of the University with respiratory distress. She was having cough, nasal congestion, and fever for one week. She also had decreased in feeding and activity. Further medical history was unremarkable. At admission, her temperature was 37.7° C, respiratory rate was 50/min and O 2 saturation was 94% in room air. Her chest examination revealed intercostal retractions, bilateral fair air entry with crepitation and rhonchi. She had neither skin rash nor abnormalities in heart and abdominal examinations. Analysis of blood drawn at the day of admission revealed positive C-reactive protein, erythrocyte sedimentation rate 25. Complete blood count showed leukocytosis predominantly neutrophilia and no bacterial growth was detected in blood culture. Nasopharyngeal aspirate tested by PCR was positive for Respiratory Syncytial Virus. Chest radiography showed bilateral streaky infiltrate with no consolidation. Patient was admitted to pediatric ward as bronchiolitis and bronchopnemonia. She was started on albuterol, hypertonic saline, oxygen therapy, and Antibiotics. She showed improvement within 48 hours in regard of respiratory effort and oxygen flow. She continued to spike fever for four days with the highest spike reaching 40° C. She was fit for discharge after five days of admission. On December 24, 2010, an 18-month-old girl who is a known case of bronchial asthma was seen in the emergency department of King Fahd Hospital of the University with respiratory distress. She was having cough, shortness of breath, vomiting and watery diarrhea for 3 days. Further medical history was unremarkable. At admission, temperature was 37 °C, respiratory rate was 56/min, and oxygen saturation was 92% in room air. Her throat and nasal mucosa were congested. Her chest examination revealed bilateral fair air entry with prolonged expiratory phase and expiratory rhonchi. She had neither skin rash nor abnormalities in heart and abdominal examinations. Analysis of blood drawn at the day of admission revealed PCo2 of 36.5, positive C-reactive protein, erythrocyte sedimentation rate 14, and no bacterial growth in blood culture. Complete blood count and electrolyte were within normal reference range. Chest radiography showed right middle lobe consolidation and hyperinflation. Patient was admitted to pediatric ward. She was started on albuterol, ipratropium bromide, budesonide, oxygen therapy, and antibiotics. She showed improvement after 72 hours in regard of respiratory effort and oxygen flow rate. She was afebrile during admission. She was fit for discharge after 5 days of admission. On December 29, 2010, a 4-year-old boy known case of cerebral palsy and developmental delay was seen in the emergency department of King Fahd Hospital of the University with respiratory distress. He was having cough, coryza, and fever for 1 week and noticed to have decreased feeding. At admission, his temperature was 40 °C, respiratory rate was 58/min, and oxygen saturation was 98% in room air. His chest examination revealed intercostal retractions and bilateral fair air entry with crepitation. He had neither skin rash nor abnormalities in abdomen and heart examinations. Analysis of blood drawn at the day of admission revealed positive C-reactive protein, erythrocyte sedimentation rate 37, and no growth in blood and throat cultures. Complete blood count showed leukocytosis predominantly neutrophilia. Electrolyte and hepatic markers were within normal reference ranges. Chest radiography showed barrel shape chest and right middle and lower lobe consolidation with perihilar infiltrate. Patient was admitted to pediatric ward. He was started on antibiotics and oxygen therapy. Patient continued to spike fever for 48 hours with the highest spike 40.8 °C. He showed improvement in regard of respiratory effort and oxygen requirement after 72 hours. Co-infection with other viruses is high reaching 22-75% in different studies. , This raises the issue of whether HBoV infection is primary or secondary in origin. One of our patients had positive respiratory syncytial virus in the nasopharyngeal aspirate, which may contribute to the etiology, but not severity of the illness. The study design did not include detection of the virus in respiratory secretions as asymptomatic children may have the virus in respiratory secretion persistently. We believe that seropositive PCR could be a more reliable tool in diagnosis. HBoV is a common respiratory pathogen known to be associated with LRTI in young children. Clinical presentation ranged from mild to severe disease. Blood testing may aid in confirmation of HBoV infection. Samples used in this study were also described elsewhere. Further prospective large studies are needed to identify the accuracy of HBoV PCR testing of blood sample in making the diagnosis. Nair H, Simões EA, Rudan I, Gessner BD, Azziz-Baumgartner E, Zhang JS, et al; Severe Acute Lower Respiratory Infections Working Group. Global and regional burden of hospital admissions for severe acute lower respiratory infections in young children in 2010: A systematic analysis. Lancet 2013;381:1380-90. World Health Organization. World Health Statistics 2013. Geneva; 2013. Allander T, Tammi MT, Eriksson M, Bjerkner A, Tiveljung-Lindell A, Andersson B. Cloning of a human parvovirus by molecular screening of respiratory tract samples. Proc Natl Acad Sci U S A 2005;102:12891-6. Ma X, Endo R, Ishiguro N, Ebihara T, Ishiko H, Ariga T, et al. Detection of human bocavirus in Japanese children with lower respiratory tract infections. J Clin Microbiol 2006;44:1132-4. Allander T, Jartti T, Gupta S, Niesters HG, Lehtinen P, Osterback R, et al. Human bocavirus and acute wheezing in children. Clin Infect Dis 2007;44:904-10. Khamrin P, Malasao R, Chaimongkol N, Ukarapol N, Kongsricharoern T, Okitsu S, et al. Circulating of human bocavirus 1, 2, 3, and 4 in pediatric patients with acute gastroenteritis in Thailand. Infect Genet Evol 2012;12:565-9. Kesebir D, Vazquez M, Weibel C, Shapiro ED, Ferguson D, Landry ML, et al. Human bocavirus infection in young children in the United States: Molecular epidemiological profile and clinical characteristics of a newly emerging respiratory virus. J Infect Dis 2006;194:1276-82. Kim JS, Lim CS, Kim YK, Lee KN, Lee CK. Human bocavirus in patients with respiratory tract infection. Korean J Lab Med 2011;31:179-84. Körner RW, Söderlund-Venermo M, van Koningsbruggen-Rietschel S, Kaiser R, Malecki M, Schildgen O. Severe human bocavirus infection, Germany. Emerg Infect Dis 2011;17:2303-5. Moriyama Y, Hamada H, Okada M, Tsuchiya N, Maru H, Shirato Y, et al. Distinctive clinical features of human bocavirus in children younger than 2 years. Eur J Pediatr 2010;169:1087-92. Zhou W, Lin F, Teng L, Li H, Hou J, Tong R, et al. Prevalence of herpes and respiratory viruses in induced sputum among hospitalized children with non typical bacterial community-acquired pneumonia. PLoS One 2013;8:e79477. Meriluoto M, Hedman L, Tanner L, Simell V, Mäkinen M, Simell S, et al. Association of human bocavirus 1 infection with respiratory disease in childhood follow-up study, Finland. Emerg Infec Dis 2012;18:264-71. Gierer S, Hofmann-Winkler H, Albuali WH, Bertram S, Al-Rubaish AM, Yousef AA, et al. Lack of MERS coronavirus neutralizing antibodies in humans, eastern province, Saudi Arabia. Emerg Infect Dis 2013;19:2034-6.